The Groninger University Fund (GUF) supports students who want to study or to follow an internship abroad for a while, contributing to travel and accommodation costs. For example, Jeri Nijland, master student Biology at the Faculty of Science & Engineering. 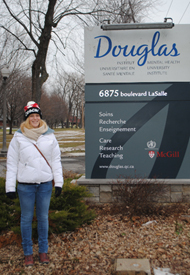 She followed a research internship at the McGill University in Montreal from October 2014 to May 2015. The purpose of her internship was to study light therapy as an intervention for the treatment of depression in patients suffering from a bipolar disorder. There are currently few good treatments for this group of patients. Light therapy could possibly mean something as this has shown a positive effect on other types of depression. In addition, bipolar patients often suffer from disturbed sleep and disordered rhythms in activity throughout the day. The idea is that these factors may affect the state of mind. During her project, Jeri studied the effects of light therapy on sleep and rhythms in activity in depressed bipolar patients. The results showed a number of very interesting findings, and at the moment she is together with prof. dr. Boivin and prof. dr. Beaulieu busy getting the findings published. All in all, my study visit has been an incredibly fine educational experience, in which I have developed both professionally and socially and have learned a lot. I would like to thank the Groninger University Fund for the financial contribution that this trip has made possible. The Groninger University Fund would like to give more students the opportunity to study abroad, but unfortunately there are not sufficient resources. Would you please to help the Groninger University Fund? The students introduce themselves and tell what they want to achieve with a scholarship from the GUF. The Groningen University Fund (“GUF”) was founded on March 4, 1893 by the professors of the Groningen University. The Groningen University Fund is a public benefit organisation (PBO) under Dutch law. Public Benefit Organisations are entitled to make use of specific Dutch tax advantages. Donations to the GUF are tax deductable. For this campaign the GUF is supported by its sister organisation the Ubbo Emmius Foundation, that also holds a PBO status. Your donation will be handled by the UEF, but will be transferred for the full 100% to the GUF. More about the GUF and her activities can be found here. Especially for its fundraising the University of Groningen established the Ubbo Emmius Fund (UEF), named after the first rector of our university. The UEF is an independent foundation with an independent board led by Paul Polman (CEO Unilever). The board members, all former students of the university receive no remuneration for their work.